It's funny to think that at the ripe age of 1, Griffin has a best friend. 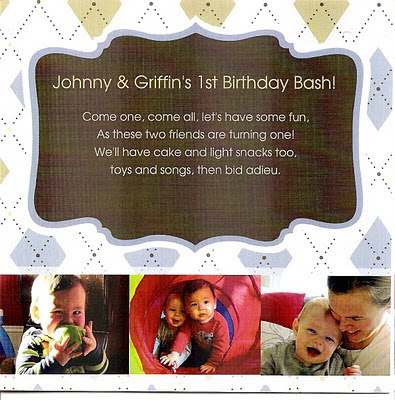 Griffin and Johnny first met when they were 8 and 6 weeks old respectively. 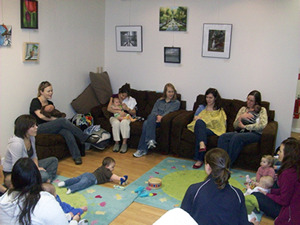 Megan and I both happened to tote our little bundled bundles to an infant playgroup at Crunchy Granola Baby one fateful Friday morning in early March 2010. Megan found the below picture on a random website- It was taken the day we met; you can see us sitting next to each other in the corner. Today, the Gonzales Family moved from their 3rd floor Kings Beach Rd apartment down to Haverford, a suburb of Philadelphia- home of my favorite airport pretzel. The whole day, or really the whole last month in anticipation of today, has been really emotional and sad, though I've handled it surprisingly well (denial perhaps?). Tom joked that we were couple dating Megan and Ryan- that we had brought them up to Maine to meet his parents... aw, it's so sad to see them go. I know that, albeit short, the time Megan, Johnny, Griff, and I spent together allowed us to build lifelong friendships. It's like when people go through a war together, they build a deep bond because they shared a tough experience and triumphed (hopefully). I think that Mom-friends are just like that, not that motherhood is comparable to war, though some may think so (heck, my labor room looked like a bloody war zone.. sorry, TMI). Its just that we've been through the craziest year of our lives together, and we've supported and leaned on each other all the way through, and it's been a blast. Megan and I also happen to get along perfectly as we are very alike. She's like the sister I never had. We share an almost identical parenting style (I'd trust her in a heartbeat with Griffin), and ironically a similar fashion style as well (Griff and Johnny wore many of the same onsies, and last month, Megan and I literally wore the exact same outfit to the Children's Museum- jeans and a black scoop neck sweater). I know we'll be attending each other's son's weddings in 25 years. Today made me realize how lucky we are that our boys are still so young that they don't even know to be sad. Ignorance is definitely bliss in this case, and as a parent, I know there are going to be times when Griffin is sad or disappointed by something, and it will be my job to help him through whatever it is. I welcome those challenges but I definitely don't look forward to them. It's hard for me to think about, as I just want to protect him from everything bad/sad in the world. I thought I was the shiznizzle when I was 15 and my dad got me my first cell phone, which by the way was the size of a small brick. Today at the ripe age of uno, Griffin inherited 2 retired Motorola Razors and a Samsung slider phone courtesy of Megan and Ryan. Megan asked me to recycle a bag of their old cell phones and accessories, and I garbage picked these treasures for Griff to play with in hopes that they'd be a replacement for my poor cell phone that spends about a third of it's life in Griffin's wet mouth. Anyway, the point of my story is that when Griffin heard my phone ring, he put a Razor up to his ear and mimicked me saying "Hello?" He said a 2-syllable word that vaguely rhymed with "hello", and he even matched my tone and intonation. Adorable! Griffin ate a french fry at The Tides 2 weeks ago on 1/2/11 (he had a few more today at Greenland Cafe)... and we fed him his first pizza (it was take out from Little Caesars) on 1/8/11. He loved pizza (takes after his Mom), and only liked french fries (must take after the milk man). 1. Mcdonalds drive thru for small vanilla cones (We turned up the heat in the car so we were warm enough to eat ice cream). 3. We stopped in to check out Laser Quest, a laser tag place in Danvers, but decided it would be more fun to play with a bunch of friends instead of just the two of us. 4. In lieu of laser tag, I got a manicure while Tom browsed at the nearby snowboard/ski shop and treated himself to a white hot chocolate at DD. 5. The highlight of the night: We went on "The Jumpy Thing" at the Liberty Tree Mall. $7 for 3 minutes of unparalleled excitement! The two of us were screaming at the top of our lungs as we jumped 25 feet in the air. The mall walkers must have thought we were crazzzzzy. 7. Dinner at Su Chang's, one of our favorite places! 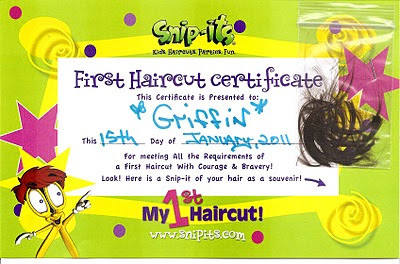 Our adventure of yesterday (1/15/11) was taking Griffin out to Snip-Its in Danvers for his very first haircut. We've been wanting to hold out to bring Griff up to Maine, where all of the Hendrix men get their hair cut by Ann, but the almost braid-able tail growing on the back of Griff's head told us it was time... Oh the hilarity! 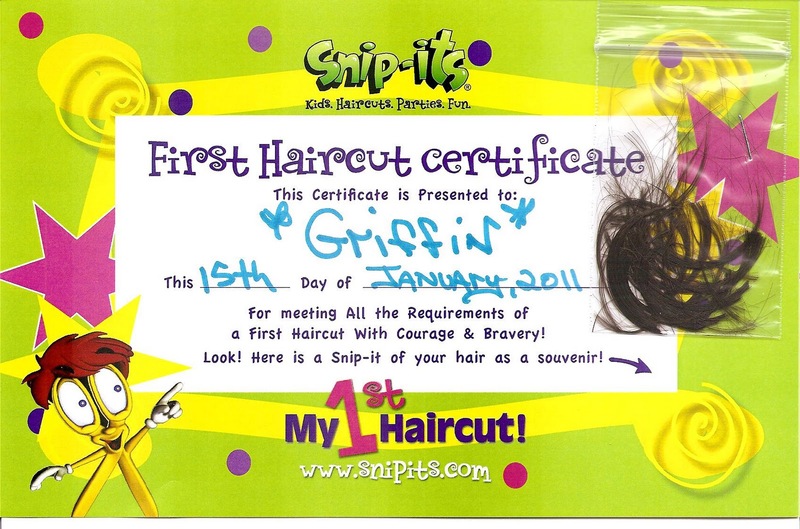 For $14.99 + tip, Griff got a hair makeover in the Disneyworld of north shore barber shops that transformed him from baby to little boy, and we got a certificate documenting the experience along with a mini ziplock full of his little dark brown locks. All it took was a slightly undersized barber chair with straps, Lovie in hand, 7 minutes of fast snipping and buzzing by Christine, some kid moose and hair spray, and about 10 animal crackers to keep Griff distracted. He survived the experience with just a few tears. Today Megan, Martha and I treated ourselves to a well deserved morning at Bella Sante Spa downtown on Newbury Street. We were able to use up some ancient gift cards we had, and the timing worked out perfectly that all of us could get away for a few hours. Seeing as all of our boys turn(ed) one this month and we made it successfully through our first year of motherhood, 50 minute swedish massages, complete with neck stretching, hot towels on our feet, cozy robes, and mint infused pomegranate tea, were the perfect way for us to celebrate together. Each of us walked out of our massage "cabins" with huge grins on our faces. About a year later on January 9th, 2011. Griffin and I are trapped at home today due to a massive "weather bomb"(I heard this term on the news last night referencing the big blizzard that's coating the northeast). The view out our big kitchen window this morning looks like an Ansel Adams photo; the tree branches of the tall maples behind Joyce's house are perfectly coated in white, and big fluffy cotton ball snowflakes continue to swirl around the air. Happy Birthday Griffin, Portraits of a 1 year old! Johnny & Griffin's Birthday Playdate Bash! Well folks, it's official, Megan, Ryan, Tom, and I just pulled off the best 1-year old birthday playdate bash of the century, well ok, of January 9th, 2010. We just arrived home with an exhausted almost-1-year-old. The birthday boys, the food, the decorations, and the fun were all just as we expected - awesome!